IMPORTANT: We do not encourage you to make changes to the predefined languages, since these changes could be overwritten when the system is upgraded. If you need to change some labels in TSR, we encourage you to export the language that comes closest, make the necessary corrections and import as a new user defined language. Menu path: Technical Management > Localization > Edit languages. Step 1: Click on “Add new language”. Step 2: Select a preferred language from the list. This will be used as basis for your new language. Step 3: Enter language name. Step 4: Click on “Edit” next to a Resource Key that you wish to change, change its value then click on the corresponding “Update”. 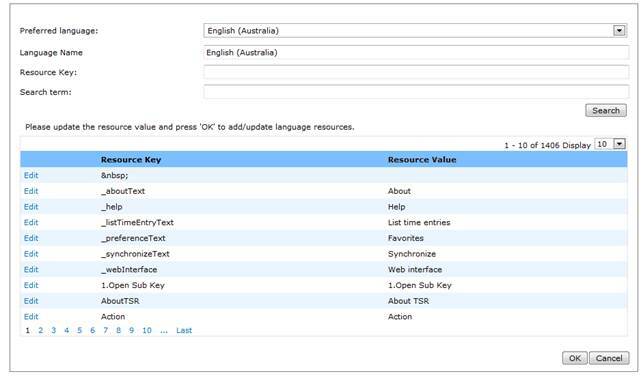 If you want to search for specific resource keys, enter keyword and click the “Search” button. Step 5: Click the OK button to save. Menu path: Technical Management > Localization > Edit language. Step 1: Click on the language name that you wish to edit. Step 2: Change the language name if you wish. Step 3: Click “Edit” next to a Resource Key that you wish to change, change its value and then click the corresponding “Update”. If you wish to search for specific resource keys, enter keyword and then click the “Search” button. Menu path: Technical Management > Localization > Import/Export language files. Step 1: Select “Import” from the Action Type combo box. Step 2: Click the “Next” button. Step 3: Select the language that you wish to import, from the dropdown list. Step 4: Enter the name you wish to call your language (it will be saved under this value). If the entered language name does not exist in the TSR, the system will insert a new language into the language list. Step 5: Click the “Next” button. Step 6: Click “Browse…” to select the file to import and click on the “Next” button. Step 7: Click the “Import” button and then the OK button on the confirmation pop-up. Step 9: Click the “Finish” button. Step 10: Click the OK button on the confirmation pop-up. Step 1: Select “Export” from the “Action Type” combo box. Step 3: Select a language to export. Step 4: Click the “Next” button. Step 5: Click the “Export” button. Step 6: Click on the OK button on the confirmation pop-up. Step 7: Enter a file name and then click the “Save File” button.